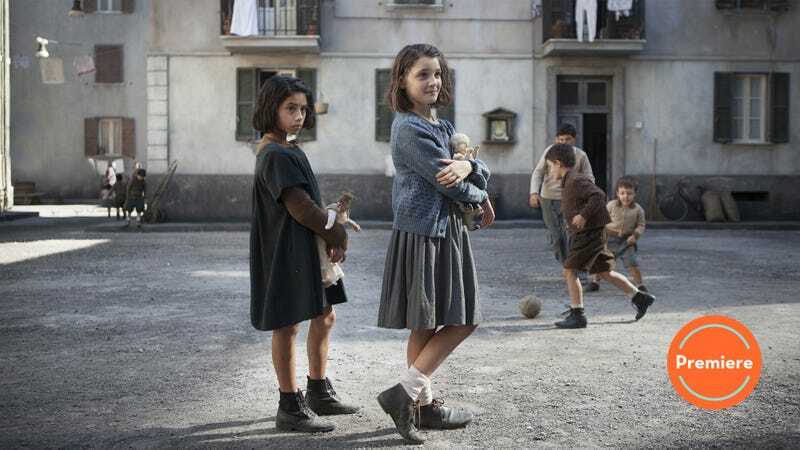 It marks a major turning point in “Le Bambole (The Dolls)” when the daring Lila (Ludovica Nasti) stands in the courtyard of several apartment buildings, calling up to Lenù (Elisa Del Genio) to come out and play. It’s a big step. Before this moment, the two girls alternately circled, struck out at, or studied each other (the last, largely Lenù’s domain). They have connected in brief flashes, but this is a chance to turn a corner. Lila calls up, Lenù hears her, and it takes her only a moment to decide. She’ll come down, and a friendship will begin. By the time she reaches the ground floor, Lila has turned a corner of her own—a literal one, around which she’s being violently confronted by one of the neighborhood’s big bad wolves. As she shouts up into the older boy’s face, we see Lenù process what’s happening, and realize the choice before her. But is it a choice? She came down those stairs. She’s in this now. She stands up for her new friend just as Lila stands up for herself, and within moments, they’re crumpled side by side in the dust. It’s a big moment, Lenù’s choice, made in direct opposition to her family’s orders to the contrary. The violent young man is the son of Don Achille, the violent loan shark and “ogre of fairy tales” whose presence seems to infect the neighborhood with fear. His assault on Lila is nothing unusual—in the first episode of HBO’s compelling, intoxicating adaptation of Elena Ferrante’s My Brilliant Friend, we see rocks thrown at a child (also Lila), an altercation in a classroom, many faces smacked, a man shouting accusations in the street, and that same man later bloodied and hurled at a wall. A widow screams at her upstairs neighbor from a balcony, and the neighborhood comes out to comment on the scene by shouting to each other from their own balconies, creating a cacophony of gossip and strife. Later, a tussle between the widow and her neighbor sees the former tossed down a flight of stairs; when the latter, her husband, and their children leave the complex, we see the widow’s anguish only in the pots and pans she tosses out the window, keening. Once, she tosses an iron. It misses a child by inches. Life goes on. All that is to say that Lenù’s decision to come down those stairs doesn’t suddenly introduce violence and noise into her world. But she’s drawn to Lila, and when she allows herself to be pulled, finally and inextricably, into the orbit of this bold, brilliant girl, the danger suddenly increases tenfold. The same can be said of My Brilliant Friend itself. From the arresting opening moments, in which the adult Lenù, or Elena (Elisabetta De Palo) receives a call from the son of her brilliant friend, the audience is similarly compelled to observe. We’re drawn by her, eager to learn as much as possible about the woman who, as an adult, has chosen to disappear, leaving behind her not a stitch of clothing, nor a piece of mail, and even cutting herself out of all the family’s photos. But it’s not until that friendship begins that My Brilliant Friend begins to feel immediate and dangerous. Before that corner is rounded, we watch. After, we’re in the dust in Naples, too. That’s not to say that “Le Bambole (The Dolls),” cunningly directed (as all episodes of this first season will be) by Saverio Costanzo, is all wind-up. Far from it. But the sense that the story only truly begins when the friendship does makes the experience of watching this first episode an unusual one. Constanzo and cinematographer Fabio Cianchetti help to signal this shift. Before Lenù and Lila make things official, so to speak, their neighborhood in Naples is captured in detail (the world-building is no joke; the texture and sense of place are as rich and immediate as anything on Outlander or Game Of Thrones.) It’s even sometimes glimpsed from a child’s perspective, the camera lingering just behind Lenù’s shoulder, as is the case when she sneaks into an upstairs apartment to see a dead man lying in repose—the body itself is right in her line of vision, and we see a lot of the elbows and arms of grown-ups. But once the two girls enter this friendship—and more specifically, once Lenù begins to see things and act as Lila does—there’s a shift. A trip to a cellar to retrieve the dolls of the episode’s title suddenly looks like something out of a fairy tale, or even a horror movie; every shadow is ominous and alive. The chaos that’s been playing out in the building is no longer uncomfortable and tawdry, but tragic, almost operatic; Lenù no longer gawks, but as Lila already has, begins to true nature of the conflict and the undeniable wrongness of two women locked into a private war because of the actions of a man, who is largely spared both the chaos and the shame to which the women are subjected. When Lenù first sees this conflict play out physically, she drops into a dead faint (and a very unsettling dream sequence). It’s too much. Post-Lila, she stands witness to it, an event undeniably tragic and almost operatic, and like her new friend, is driven to act. That it’s possible to read so much into the interior lives of these girls is a testament to the young performers. Nasti and Genio both give tremendous performances, capturing (respectively) the watchfulness and wildness of the richly-drawn characters they play. But it’s also a testament to Constanzo, who in addition to directing, is one of four credited writers for the series (alongside Laura Paolucci, Francesco Piccolo, and Ferrante herself). Theirs is an extremely faithful adaptation, but there’s no trace of mustiness, no sense that this would all make just a little more sense on the page. By peering into this world through Lenù’s eyes, we’re able to experience visually what her voiceovers (given as an adult) allow narratively—a sense of how dramatically her world shifts when this friendship begins. It’s an auspicious start for the series. If “Le Bambole (The Dolls)” is an indication of the level of thoughtfulness we can expect from Constanzo and company, there are great things to come. At a cursory glance, this premiere might seem like it’s all set-up and little action; the corner isn’t rounded until the final 10 minutes. 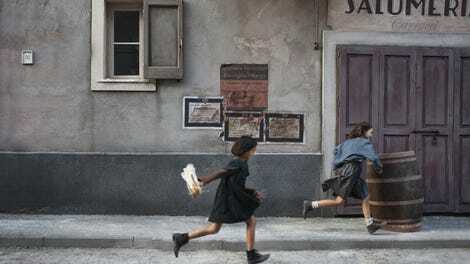 But My Brilliant Friend does something much more cunning—it shows us how dramatically this connection changes the lives of its central characters by setting a status quo, then throwing it out the window. The plot matters, but the relationship is the main event, and with this story, that’s exactly as it should be. Hi, I’m Allison, and welcome to My Brilliant Friend coverage! Episodes will run Sunday and Monday, so we’ll see you back here tomorrow night. Constanzo uses the surreal very judiciously. There’s the shot of child Lila in adult Lenú’s office, the bug dream (ugh), and the suggestion of the ogre in the basement. Yet it always feels as though something huge and inexplicable could happen at any moment. Quite a feat. About the books: When appropriate, I’ll cover big adaptive choices/changes down here in the Strays, and they’ll be clearly marked as Book stuff. That way, if you’re planning to read the series and don’t want to experience any of it beforehand, you can move past it quickly. I’d ask that if you want to discuss the books in the comments that you do the same. This is, by and large, how we’ve handled coverage of The Handmaid’s Tale, and it has worked pretty well.